Welcome to your 2016 Nitto Tire Formula Drift Roster! 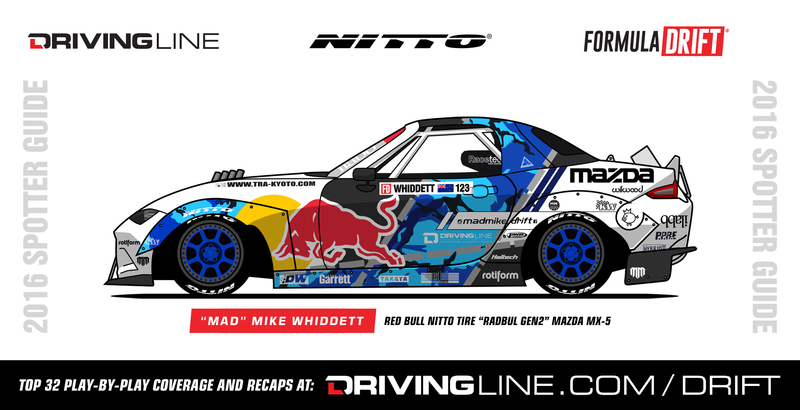 Former Formula Drift champion Vaughn Gittin Jr. and international fan favorite "Mad" Mike Whiddett are back for another season with Team Nitto but joining these veterans is the up-and-coming Alex Heilbrunn, the 2015 Formula Drift Pro 2 champion. 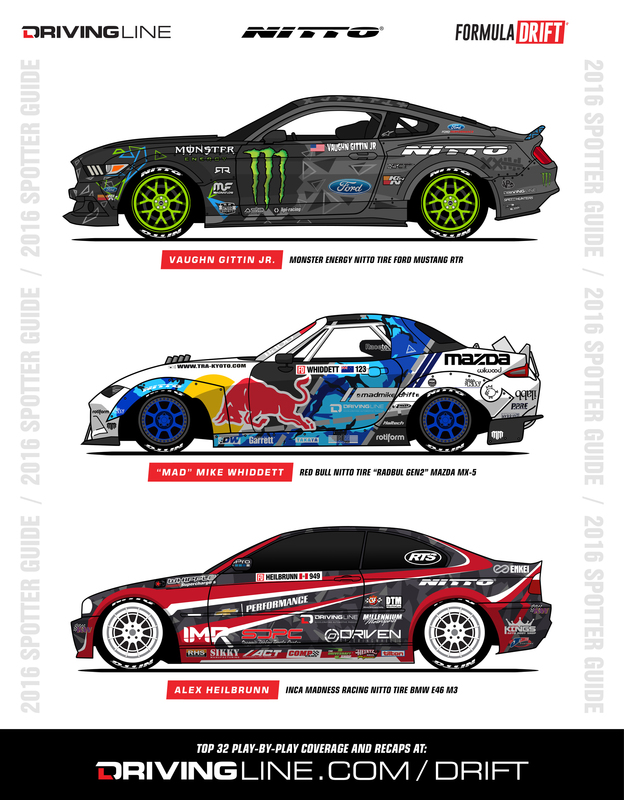 All three drivers will be competing on the ultra-sticky NT05 tire and have brand new looks to show off, so check them out below in our exclusive Nitto Tire 2016 Formula Drift Roster Spotters Guide. 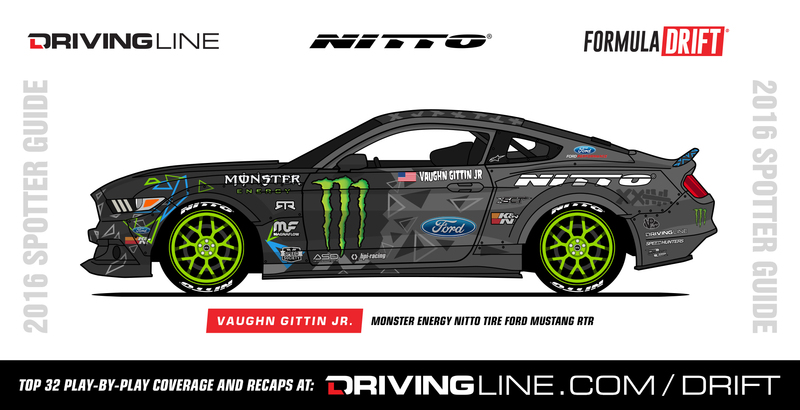 Vaughn Gittin Jr.'s 2015 season ended sooner than everyone would have liked, but with the help of his team, he was able to fine tune the performance and handling of his new 2016 Ford Mustang RTR. The Ford Performance/Roush Yates-built V8 will be cranking out over 900hp to make Vaughn's new car debut at the Streets of Long Beach a very powerful debut. One of the world's most exciting drivers around, "Mad" Mike Whiddett stole the hearts of Formula Drift fans to earn himself the 2015 Formula Drift "Fan Favorite Driver" award. This year's RADBUL will be skinned with the new 2016 Mazda MX-5 Miata's body panels, and still retains a 4-rotor monster with two turbos pushing over 1,200hp. Mike is continuing his quest to becoming a Formula Drift champion while retaining his fan favorite status. 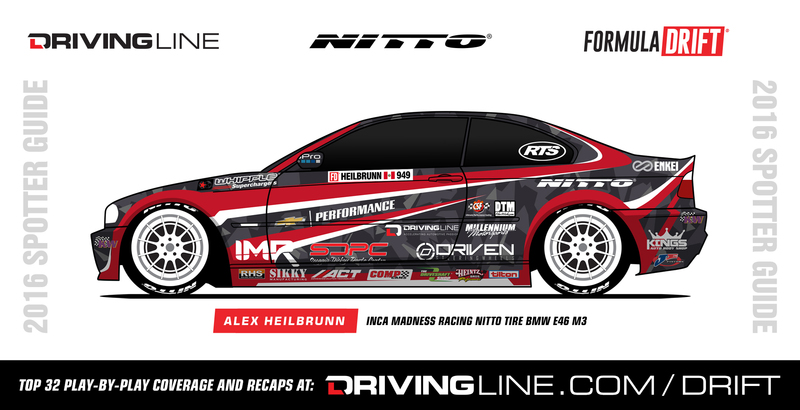 Making his Pro debut, Alex Heilbrunn has been racing nearly his entire life, from winning multiple back-to-back downhill mountain bike championships as a teen, to winning the Formula Drift Pro 2 championship last year. If his name isn't a familiar one, it soon will be as he looks to make a name for himself as part of Team Nitto with his supercharged, LS-powered BMW E46 M3. Formula Drift Round 1: Streets of Long Beach begins on April 8-9, have your spotters guide ready!